I advertised to you recently another great virtual lab environment – Unified Networking Lab – with tools like that one I practiced the cool technologies of Alcatel-Lucent Service Routing platform and prepared to many certification exams. And I encourage you to go the same way, not just read the books and force the dumps, but actually build a topology and walk through interesting scenarios. If you boot a Cisco router like 7210 one, or even Juniper vMX, you could configure some interfaces, protocols and so on right away. With Alcatel-Lucent 7750 SR this approach doomed to fail, you should know how bring to life 7750 virtual Service Router (vSR) once you booted it before any further configuration steps. And this short post will be just about that, what should you configure on 7750 SR after the first boot to make it running with Unetlab or GNS3? Once you boot a virtual Alcatel-Lucent 7750 SR router it comes up with a crystal clear configuration. To provision it with basic and necessary configuration follow these steps. 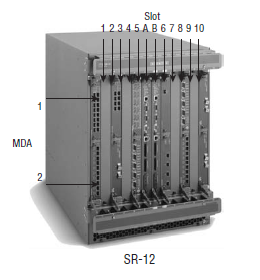 *A:ALU_R1>config>card# mda 1 mda-type "m5-1gb-sfp-b"
This configuration emulates MDA with 5 Gigabit Ethernet ports in it, which means you can use ports from 1/1/1 to 1/1/5. You cant use more that 5 GE ports with current release of Virtual 7750 SR.
Dont waste your time on routines, just copy this config and paste it to the booted router’s CLI, and you are good to go. nice info UNL supporting vSR now, which version of timos did you try and is it supporting till last version ? Hi Roman: I’ve just added R13 and won’t boot. I’ve R12 as well and working great. No problems. Added R13 following exact procedures for R12. Is there some special tweaks I need to do to make R13 work? Hi! Do you have any output from R13? Or all you see is just a black screen? tmInitFloppy, Could not initialize Floppy. TiMOS-L-13.0.R6 boot/i386 ALCATEL SR 7750 Copyright (c) 2000-2015 Alcatel-Lucent. What hardware platform do you use? Is it a workstation/baremetal server? Do you run unetlab in vmware/virtualbox or you run it natively under Ubuntu? Reinstalled unetlab and tried your suggestion editing the timos-php file enable-kvm. no luck. now the nodes won’t even start and in fact my other R12 nodes won’t start as well. I removed the -enable-kvm parameter and still none of the nodes will start (both R12 and R13). May have to do a reinstall again to get my R12 nodes to work. if any of the commands produces output – you have vurtualization HW support, which is good. If your processor does not support x2apic (nothing grepped from cpuinfo), then I am afraid you wont be able to run TiMOS R13, since x2apic seems like somewhat necessary. Still can’t run R13 despite switching to a haswell proc. Ok, since now we have almost identical HW platform setup you should try to modify timos.php (https://drive.google.com/file/d/0BwGlWrU8lplrOGtCaGNvSnZ0V28/view?usp=sharing) make a backup of original timos.php. Next, added -enable-kvm to the qemu options. Below inputs given by rasputinlv worked like charm. I am using HPE 380 Gen9 server with 64GB RAM, RHEL 7.2 OS. hi would you be able to share your domain definition (xml). I am running into x2apic is requred issue, on release 15.02R2 on RHEL7.2. Seems to me that qemu-kvm is not passing this flag. What your Intel box says when you ask it for cat /proc/cpuinfo | grep x2apic? no output when I grep for x2apic. do you get any output on yours? yep, I have x2apic supported. Actually see what model number of Intel’s Xeon do you hava? cat cpuinfo one more time and look for Model number. I have model 26. Darn it. Too old I guess. Tried it and it bombed everything like before. Nodes won’t start. I guess I need to go get myself some new Intel procs. Sadly, yes. But a new baremetal is worth the budget. I have dual Xeons and bare metal install. Love it…. timos-13.0R6 Can you give me download link? I think my vSR-OS is older (maybe R6?). Can I use more than 5 interfaces with that version? When I “plugged in” new cards/mdas I got “not equipped or provisioned”. OK. Thank you for your information! Can I run this vSR-OS image under an intel Celeron Core2 processor? I think not. Always rebooting before login: prompt. Why so slow the response from the router if I connected to it by telnet or ssh? I have question on 14Rx VM versions. It starts up “fine”, but it’s kind off empty, I can’t run almost any command. Am I doing something wrong? or something wrong with 14Rx VMs? Can you tell me how to load a valid license file in 14Rx & 13Rx VM versions??? I’ve tried to provision multiple different Cards and MDAs and always getting Ghost states, the only combination that seems to work is the one that you are providing here. The reason that I ask is because I ran into an issue trying to set up SAPs for my EPIPE services. SAPs only take access ports, but it won’t let me assign an acces port to an interface because it says there’s a mismatch (network/access) between the port and the interface. Is there a way around this ? I’m very new to Alcatel. TiMOS-B-12.0.R6 both/i386 ALCATEL SR 7750 Copyright (c) 2000-2014 Alcatel-Lucent. you are right, for vSROS this is the only option of configuring cards and mdas — 1 MDA with 5 ports at max. I can confirm the L2 forwarding works fine on these CSR1000v because I’ve tested it between 2 of them, but even if L2 forwarding doesn’t work for the TiMOS, the data plane should be working and show the pseudowire up, right ? Sorry if I missed something, please let me know if you need any more information to kind of point on the right direction. Thank you !. Mmm.. okay then my problem must be somewhere else.. I’ll keep looking, thank you Roman ! I am trying to setup SR 7750 v14 over Virtualbox and also tried vmware as well. When I trigger a first boot, I only see Booting… and nothing else. Is there anything that I am missing here? you tell me how to add IOM & MDA in these images. They are not present by default like TiMOS 12.0.R6/R8 vSIM images. Last listing at this post shows what commands need to be entered to configure IOM and ports. I am aware about the commands as I too work on the same platform. Apologies if my query was ambiguous. When I fire a command ‘show card’, it turns up blank output. There is no card entry which is ‘unprovisioned’. Looks something like this..
Will loading the license file solve this issue?? I havnt seen such behaviour, what exact version are you running? Apologies for delay. I am using SROS 13.0.R9 and 14.0.R5. Hi Roman, I have loaded 14.0.R8 in UNL but the VM keeps on rebooting continuously. Any suggestions/help? Hi Roman, Tried but did not work :(. I have captured the boot log messages. Can I share it with you? Will it help? Hi, Does VSR images available for ALU 7450 or 7210 nodes? in GNS3 router reboot after 30 mints automatically.. what is the solution please? Do you have a license applied? I like your blog so much because you are given correct information and it also works.